The world famous Spongebob Squarepants is going to be in a NEW FILM! Come 2015. 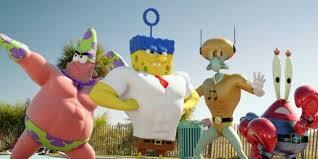 This movie will feature firmilar characters like Patrick, Sandy Cheeks, Mr. Krabs, and Plankton. In addition to the cast will be Antonio Bandera’s character Alameda Jack. This film will be ground breaking for Spongebob because the characters will be in 3D! Previous Penn and Teller’s NEW SHOW!